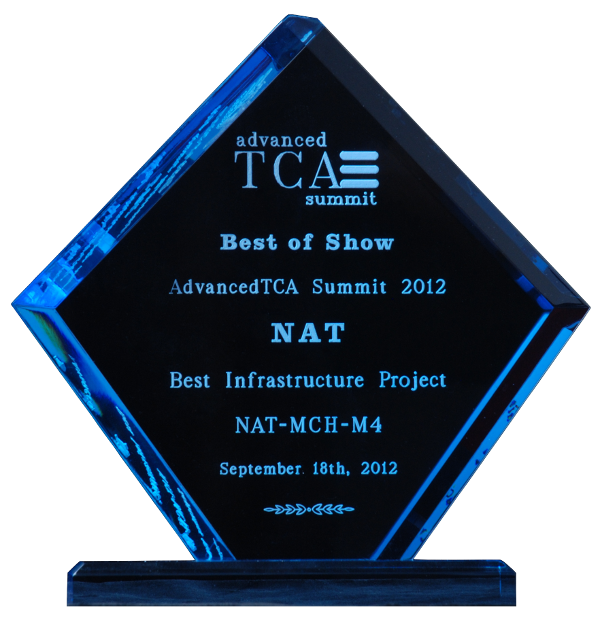 The new double-width fully featured NAT-MCH for Physics has been awarded in the category "Best Hardware Infrastructure Product"
N.A.T., the expert for high performance connectivity products for data and (tele-)communication solutions, announces that they have been awarded a prestigious “Best of Show Awards” at the ATCA Summit in Santa Clara, California, in the category “Best Infrastructure Product” with the new double-width MicroTCA Carrier Hub – the NAT-MCH-M4. The new double-width MCH, NAT-MCH-M4 is targeting at applications based on the MicroTCA.4 form factor. The distinctive feature of the new NAT-MCH-M4 is that in combination with the also available µRTM COM Express Carrier NAT-MCH-Comex, it allows applications to utilize the so far unused space behind the MCH in MTCA.4 systems. As a standard MTCA.4 was mainly driven by the international high energy physics research institutions, however, MTCA.4 is being adopted by several other industrially driven verticals. Opening the systems space behind the MCH slot provides significant functional improvement and cost savings by combining the functionality of an MCH, i.e. with the one of a PrAMC. Unlike earlier and proprietary attempts by other vendors to integrate MCH and PrAMC capabilities into a single slot in a MicroTCA system, the solution now provided by N.A.T. is fully compliant with the MicroTCA standard. Moreover, this solution actually combines both the MicroTCA and the COM Express standard, enabling significant cost savings and synergies.